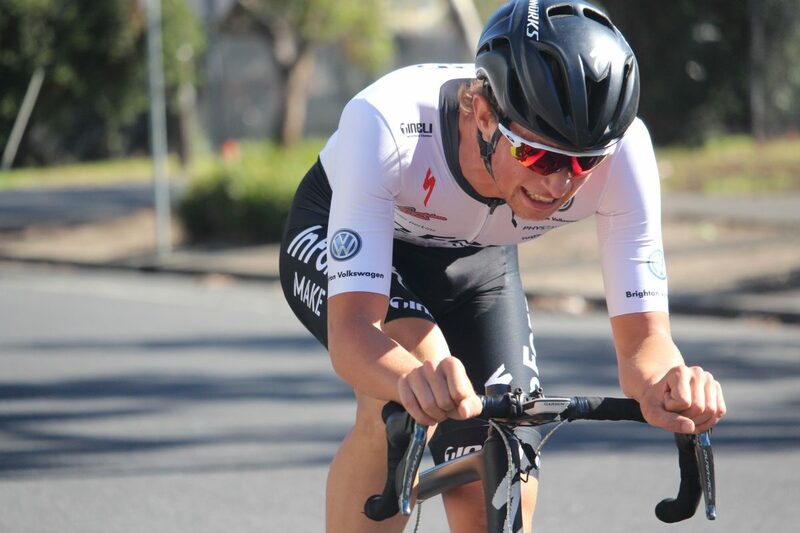 In this article I will share with you the experience of participating and spectating at St Kilda Cycling Club’s (SKCC) world famous White St criterium (crit) course. While the video below was taken at the 2018 SKCC Club Champs, the footage is a true demonstration of the family/carnival atmosphere SKCC have been able to generate down at White St over the course of their inception since 1999. In fact, SKCC have cultivated the local cycling community to a point that has seen them become the largest cycling club in Australia, with a strong enablement culture that’s been able to entice more and more women into the sport each and every year. A feat not many (if any) cycling clubs can claim. But before I talk about White St and the passionate club legends – such as Gaelene Snelling – who provide crit racing for all us mad keen cyclists. I was in my late twenties and I’d decided it was time to give up pubs and nightclubs on the weekend. Triathlons were my new thing and I finally decided it was time to stop hiring a road bike for the bike leg and buy my first bike. I soon realised running and swimming were annoying, and cycling was epic. Having a slightly addictive personality; it wasn’t long before I was hitting up the North Road Ride during the week and the Hell Ride on the weekends. I was like a dog with a bone who’d been trapped inside a small room for 30 years! Now I was finally free. I soon found criterium racing – after I bought another (faster) bike of course – and it was the SKCC White St course that was my first encounter with crit racing. I had butterflies in my stomach before the E Grade start. It was under control for most of the race and then we got to sprint the final lap. I was with my good friend Cameron McKimm (now Team Owner of InForm Make) who was on a similar journey to me, and while I swear he went before the Marshall allowed us to take off, he won the E Grade race! I came in second, but I was up to D and back at SKCC the following weekend for more crit racing. Almost 10 years later I’m still hooked on criterium racing and cycling. The vibe, atmosphere and people have not changed and the wonder that is racing at White St SKCC is something we should all feel very fortunate to have in our local cycling community. 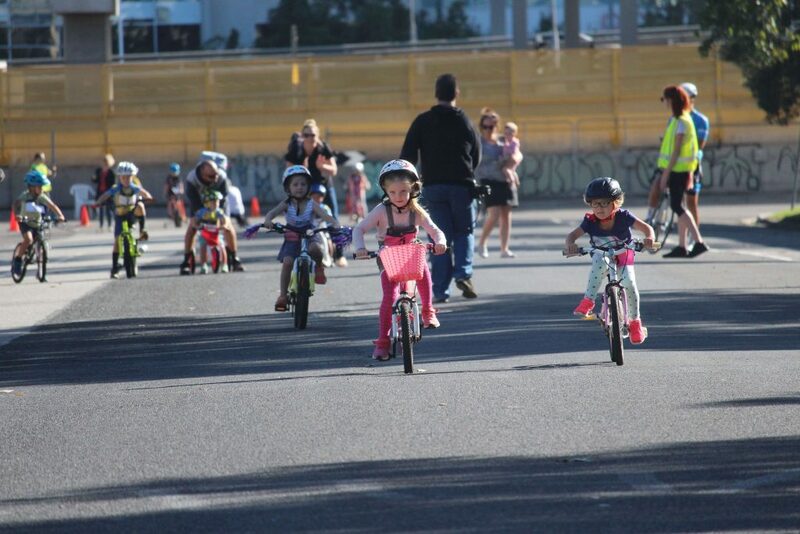 Great to see all the kids having a go on the famous SKCC White St criterium course. This is tradition at the SKCC Champs and the kids absolutely LOVE IT! The course is 1 km in length, and while the graph below shows a rise, it’s really a flat course. Shannon Johnson and Ray Hunter hold the Strava records at 1:02 minutes around. While the wind certainly can come into play down at White St – like it did at the 2018 SKCC Champs – it doesn’t seem to have as much influence as say it would at Glenvale or Sandown. According to most, White St is the fastest local crib course, and perhaps the result of there being no true corners, with exception of corner four. It’s a little easier to sit in the bunch at St Kilda, although having said that, get some of the local National Road Series teams down there (in A grade) and you’ll be hanging on for dear life. The course is perched nicely in an industrial estate in South Melbourne, rubbing shoulders with the Westgate Freeway and a number of high rise apartments that seem to be increasing by number every single year. In fact, it’s been interesting to see the development of a number of smaller town houses on the other side of the crit course, leading to a conclusion that White St is hot property. 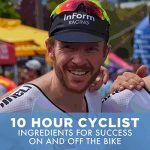 Its inner city location and leisurely ride to and from this crit course – which for many is along Melbourne’s iconic Beach Rd – certainly add to the character that is White St. But above all else it’s the people (including the committee and volunteers) who make the atmosphere and the racing down at SKCC during Melbourne’s warmer months so great. And perhaps why it has established itself as the host of one Australia’s biggest crit races – the Shimano Super Crit. 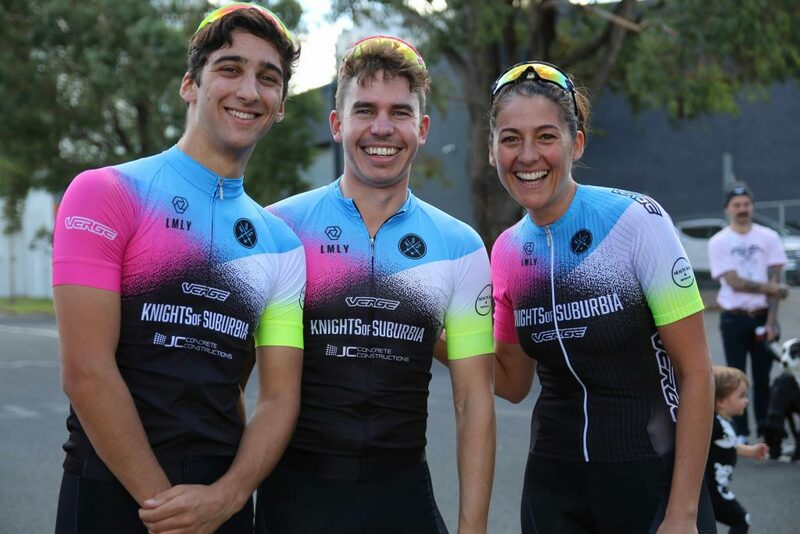 One of the great local cycling teams Knights of Suburbia showing off their colours and smiles at the SKCC Champs. Great photos that come from @MichAdventures too! If you want to know who won or you’re just interested in the race itself, I invite you to watch the video above. I’ll leave that for your eyes. The cultivation of a cycling community. Maybe I’m a little biased having two young girls myself – Holly 7 and Ruby 4 – but I loved seeing the kids at the SKCC Champs. Seeing a whole bunch of little tackers race their bikes around the circuit or up the main straight, and also them telling me on video what they love about bike riding, gave me a great sense of community and family. In addition, it’s fair to say cycling is a male dominated sport and women’s cycling still has a long road ahead. But if anyone’s leading from the front with empowering women to get into cycling, it’s SKCC. 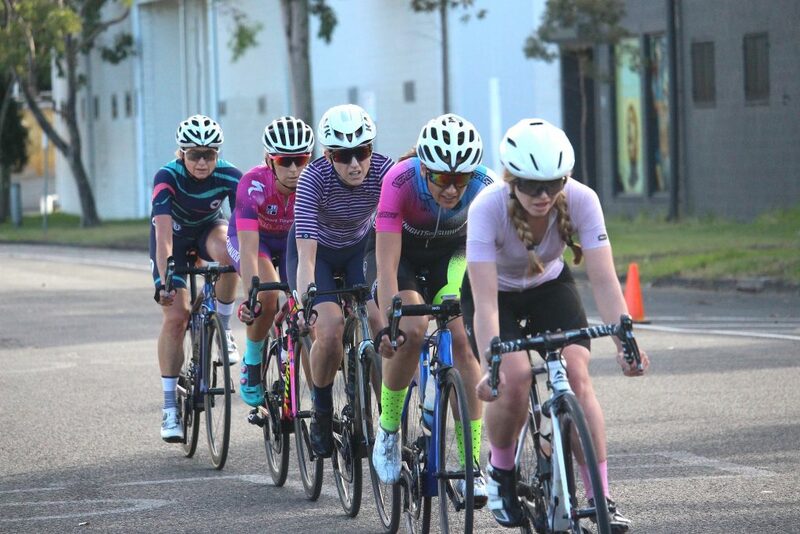 Seeing the racing on display for women at SKCC and the way they have structured the club to provide a pathway to learning and developing cycling skills for females is second to none. So the 2018 SKCC Champs was a great blend of cycling cultivation. There was racing for kids, women and the men, but above all else an atmosphere and culture that provokes the great sport of cycling for all those who set foot on White St South Melbourne on a Sunday morning. Let’s quickly take our virtual hats off for all those passionate club people who give up their time to provide a tier one platform for cycling and racing in our great local cycling community. The forecast may have scared a few off at the SKCC Champs. The women’s field was small but Amy Bradley (Total Rush) put in a massive effort off the front for the last few laps to take on the win in women’s elite. Cameron – my heart is bursting with pride at being part of this amazing cycling club! And with a passion for welcoming women into the club (a strategic move the then committee made in 2006), I’m so grateful you’ve taken the time to give voice to the club’s work. I’ll be sure to share this story & video with many, as I help the club secure a permanent crit home….for all the reasons you mention!